(written by Jen; approved by Ian) Before I write about a safari, I do some brainstorming--look at our photos from the trip, do some internet searches. In doing that, I came across an African proverb: "To get lost is to learn the way." I've seen this proverb before, and though applicable in many aspects of life, I didn't initially see its use in our safari stories. This time though it struck me as appropriate. It's the mistakes I make in photography followed by a recognition of those faults, instruction, and study which leads to better photos, and in the case of our last safari, retention of those photos. This lesson is particularly hard to swallow given the amazing sightings we had and the beauty of the lodge during our recent stay for four nights at the Mateya Safari Lodge in the Madikwe Game Reserve in South Africa. The Mateya Safari Lodge is stunning, filled with art from throughout Africa, with a history worth a read. Your room is hard to leave. When Ian saw the indoor/outdoor shower, he proclaimed that he would need to take at least two showers a day just to make sure he got as many uses out of the shower as possible. I favored the room's spacious verandah with a plunge pool butting up against the bush. I spent my afternoons napping there until the cacophony of birds would inevitably wake me up. I then watched the rainbow of birds as they bathed in the pool, weaved their nests, and flitted from tree to tree singing their songs. When I eventually made it back into the room, Ian would still be in the shower. I know, you want to see a photo of this amazing shower. Well, so do I. Read on. What drew us to Madikwe is that it is a malaria free, big-five game reserve, which boasts a wild dog population and red, iron-rich soil, which every animal seems to wear a little bit of. The red soil is a contrast to our usual safari destinations in South Africa in the Kruger. We opted for a private guide experience. Our guide Werner's knowledge of the bush and photography was deep, and our tracker Paul was silent and all-seeing, needing only to make a nod or a hand gesture to show us the animal he had spotted. The duo made for perfect relaxed and knowledgable game drives. Day 1. 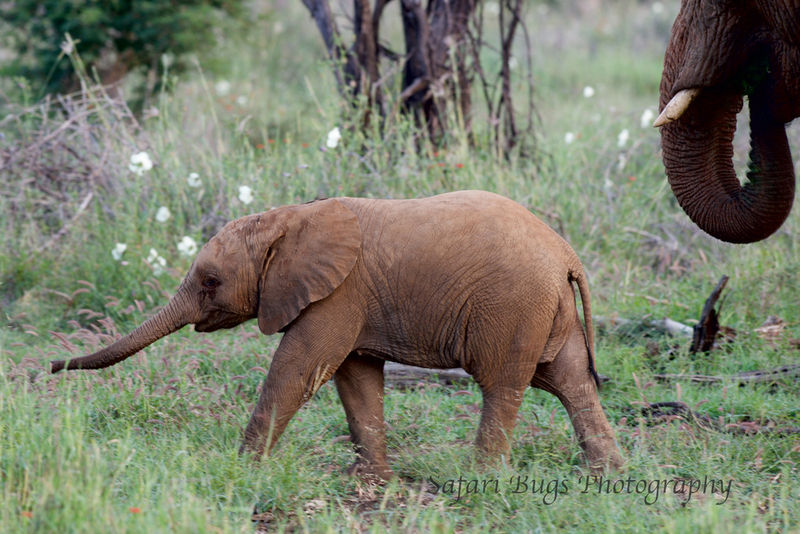 Our first evening drive brought us a close encounter with one of Madikwe's many elephants. We then meandered through the reserve getting a sense for its varied terrain. After driving through plains that you think only exist in East Africa, we arrived back at the lodge to have a private dinner on the verandah. And, by private, I mean we saw no one else except our waiter and an audacious white moth who wanted my wine. It was perfect. Before dinner, we sat by the bar for a glass of wine (me) and a gin and tonic (Ian). Often on safari, alcohol is included in your price. Unless you pay for a special bottle of wine, if you are drinking red wine, like me, you will be given maybe two types of house wines from which to chose. But not at Mateya. Mateya takes it to a whole new incredible level for the wine lover. 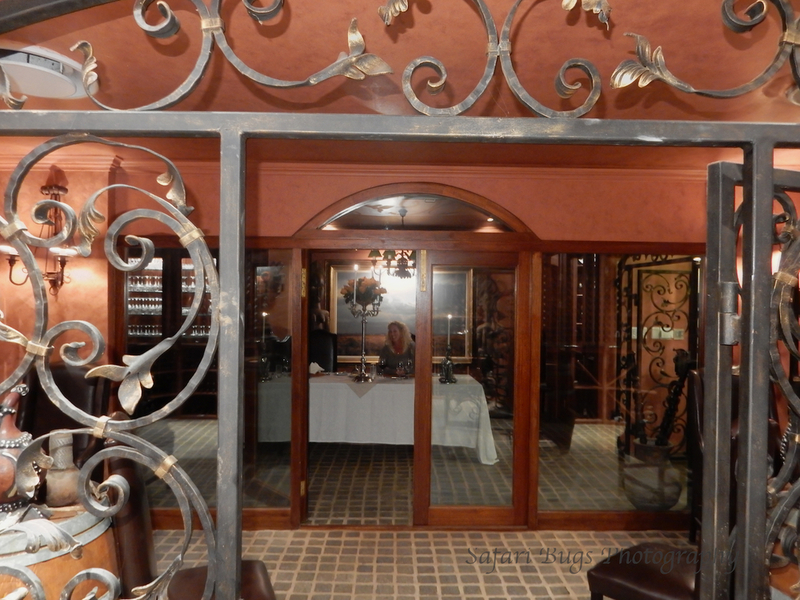 Their wine cellar contains a vast amount of South African wines, and they are all yours from which to chose. And, if there are too many choices for you, the staff is well-versed in the wine and can chose the perfect one for you. If you find one you like, don't be surprised if one of the staff members has put a second bottle in your room. Day 2. The wake-up call came early the next morning; it always does. And, when we got on the vehicle that morning, we may have been half-asleep. We quickly came across two rare black rhinos. They could have been characters in an animated film as they approached the vehicle side by side, scared themselves, quickly ran away, and then did it again--not very fierce, but definitely adorable. 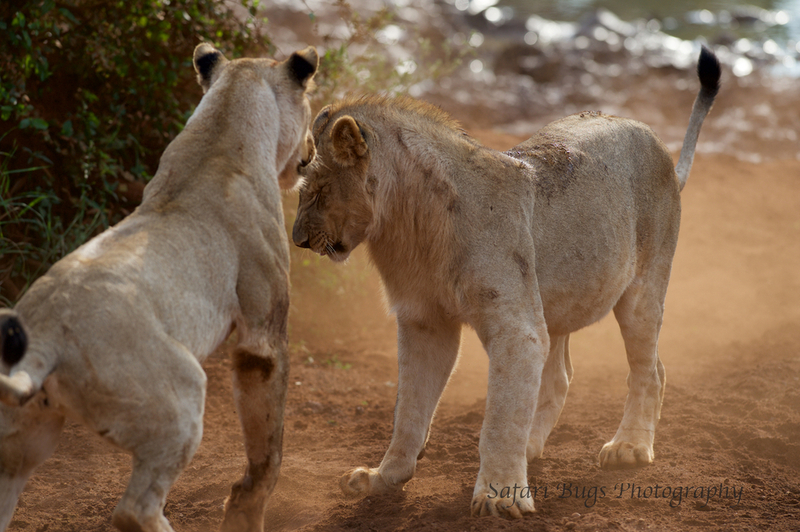 The rest of our drives that day did not disappoint as we came across two rambunctious subadult male lions who thought that playing with a stick and stalking a herd of elephants were a good way to pass the morning while the rest of the pride dozed. Boys and their sticks! That day, we also saw a hyena skulking across the tarmac, a lion reminiscent of an Aesop Fable (the one with the lion with a thorn), and a duo of cheetah in a den of iniquity with a hyena and a jackal looking to thieve a meal off of the cheetah brothers. Day 3. 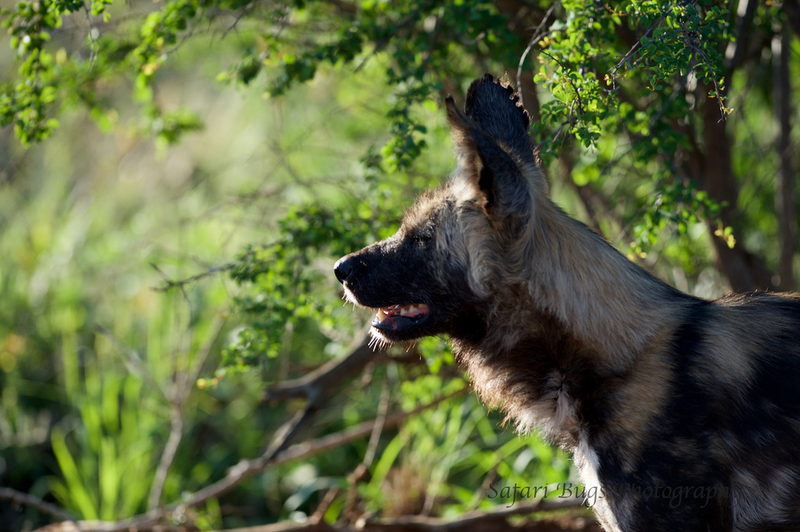 Madikwe is well-known for its wild dogs, but that doesn't mean they are easy to find. The reserve is vast and mountainous. Just prior to our visit, the rain had visited not in single spies but in battalions, causing roads to become rivers and turning cliffs into waterfalls, permanently altering the landscape and roads and scattering the wildlife. And, wild dogs, well they move in a pack like a god has damned them to always be running lest they be burned--fast and never resting. They had been seen in our general vicinity, and we decided to make a go of it. 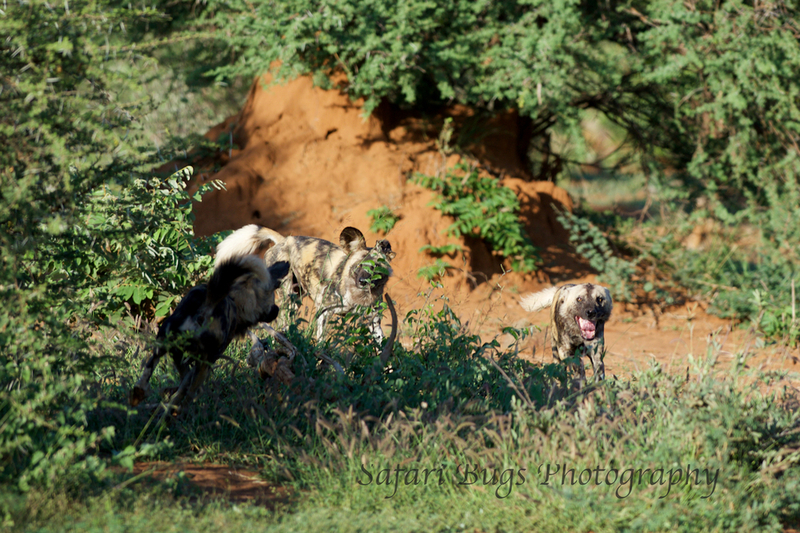 Following the alarm calls of baboons, we saw one, then two, and then we were off following the pack for a short period of time as they ran through the heavy bush--a true photographic challenge. The pack then comes together in such a way as to make you think there is truly nothing better in life than seeing a family member and coming together. The remainder of the day included a tower of food for breakfast, a long nap (and of course two showers for Ian), a Cuban cigar by the pool, really good wine from the resplendent wine cellar, a leadwood tree, a slow sunset, a regal lion, an impressive elephant, and a private dinner by the fire. Day 4. Madikwe is a park of beautiful contrasts--plains full of wildflowers and mountains with views for miles. On day four, we took a drive through the mountains to get a better sense of the park and its terrain. Sometimes, when you are at sightings it is easy to think that the park is small as you run into other vehicles. The park though is large and wild, with remote areas. During our drive, we stopped by a large pan for drinks and snacks. We could have spent our day there with a book and our cameras. Though we may have liked to spend the day and even the night out in the bush, it's a good thing we didn't or we would have missed some of the best things the lodge has to offer--its food and its view. We had been skipping lunch because of our gorging tendencies at breakfast. As it was our last full day, we felt it necessary to try lunch. We were not disappointed. Ian had a very large gyro made with kudu game meat, and I had the perfect greek salad with fresh vegetables and large pieces of feta. 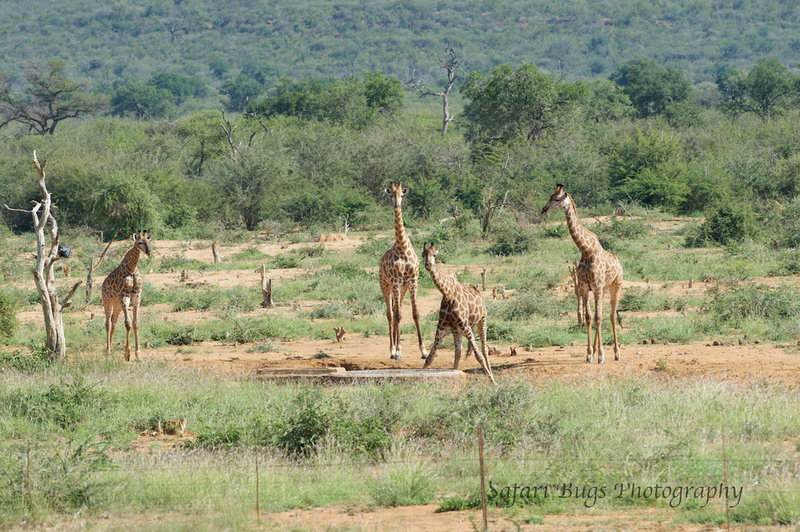 That afternoon, we were treated with a tower of giraffe at the lodge's waterhole. And, to top off the perfect day, we had a private dinner in the lodge's wine cellar. Day 5. 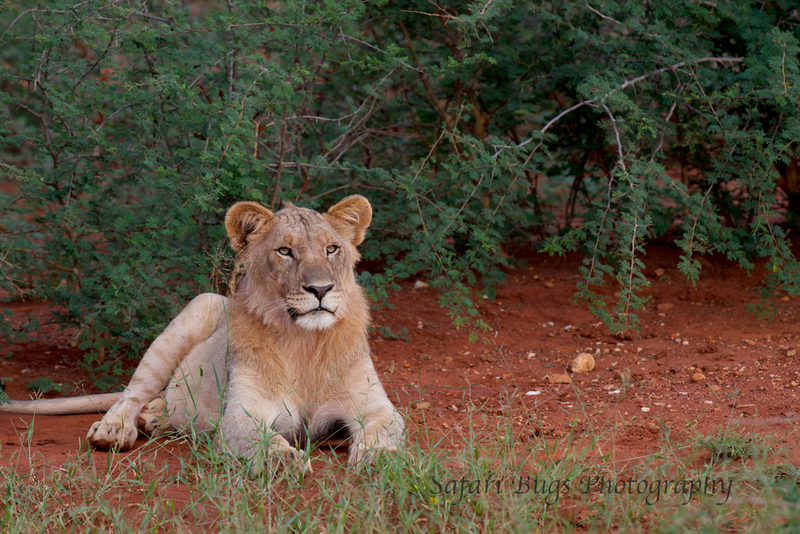 Our last day at Madikwe did not disappoint. Our goal was springbok on the plains, which we achieved easily along with a breathtaking sunrise and playful elephants. We then had a choice for the last hour of our drive--a bush walk or a lion sighting. The latter seems like the obvious choice, but bush walks are a unique way to see the bush and it feels good to stretch your legs after hours in the vehicle. Also, the lions had recently eaten and the sun was rising. So, the chances that they were doing anything but sleeping were small. That being said, I can't say no to a big cat sighting. So, it was to the lions we went. And, the sighting turned out to be one of our best lion sightings to date. That is the thrill of being on safari--you never know what will happen; the possibilities are endless and the possible scenarios can be unimaginable. When we got to the sighting, the subadults, i.e., teenagers, were in full play mode, chasing, swatting, wrestling, jumping, and playing in water. 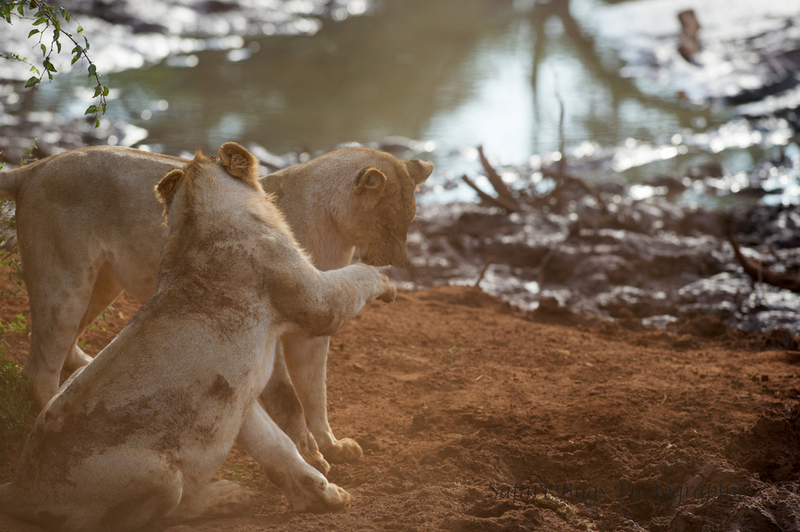 Because of the water, the position of the sun, and the way the lions were moving so quickly, it was difficult to always position the vehicle in the right place to get a good shot. 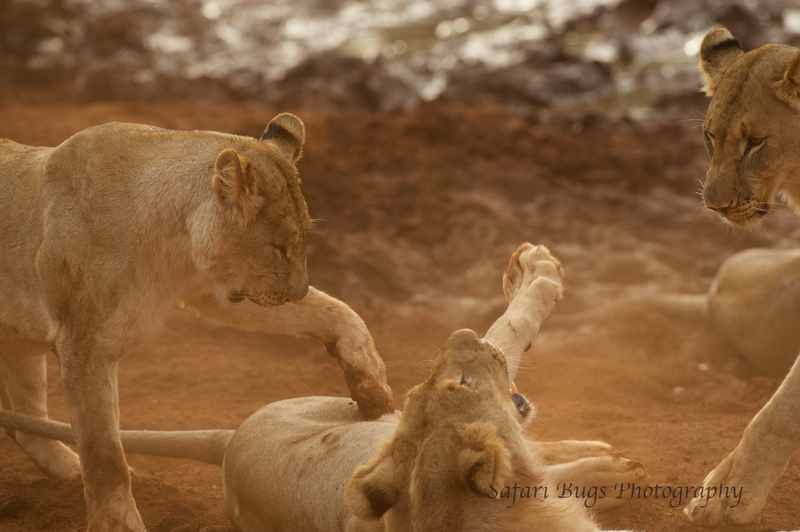 But, it was amazing to just watch them at play, to see the red soil cover them as they ran, to hear the thud as they hit each other with massive paws, and to see the trepidation on their faces as they considered jumping over the water. 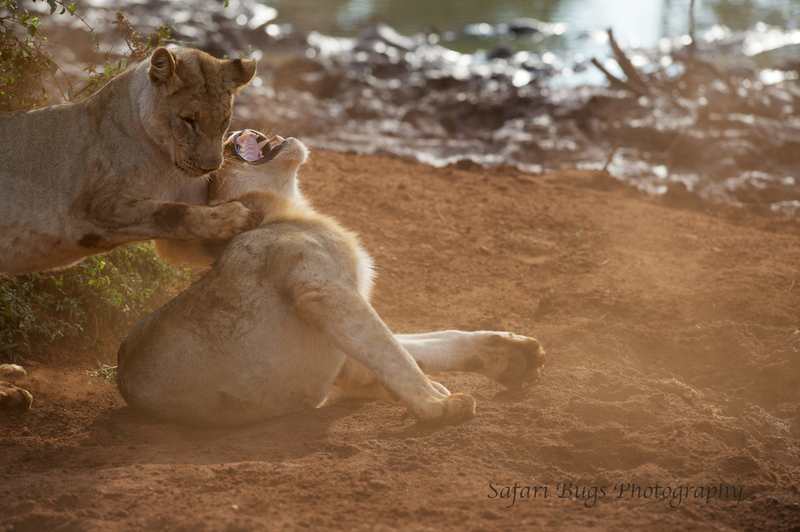 Biting is not off limits in lion play. Just look at the size of that front paw! Just when we thought they were getting tired, they started at it again. 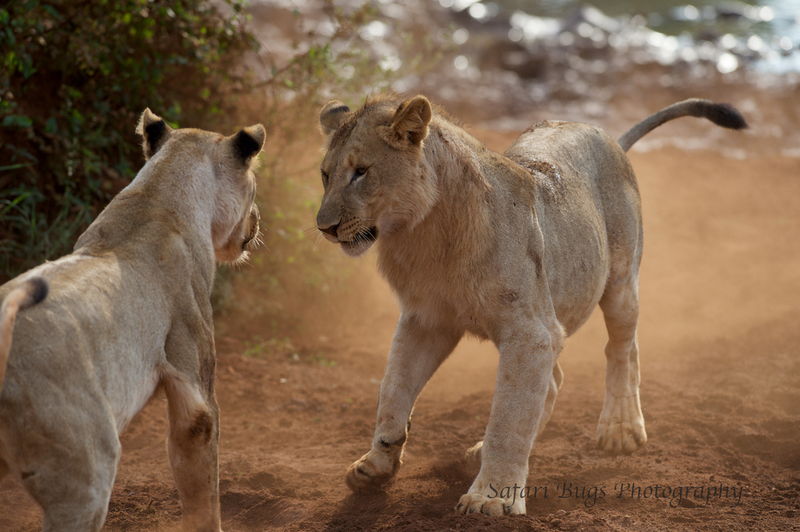 Next, I've included the full sequence of shots from the interaction so that you can get a better sense for how lions "play" and how hard it is to photograph them from your vehicle as they hit, bite, run, roll around and kick up dust. 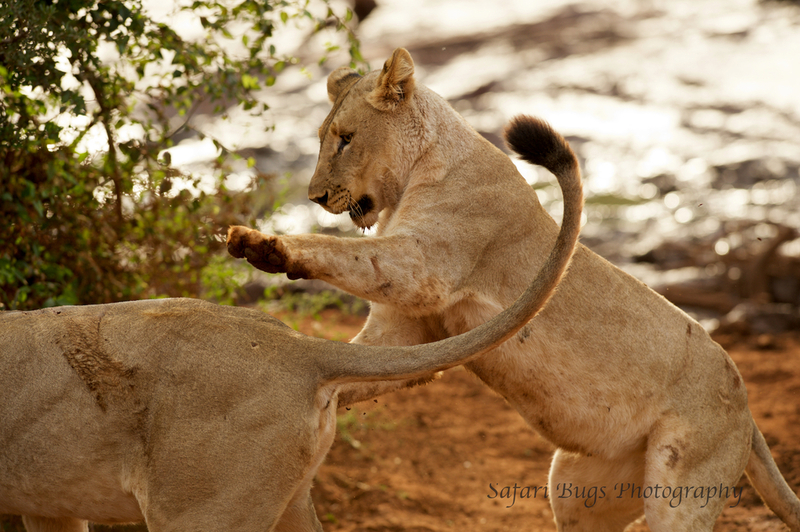 This blog post took me longer to write than some others, not because we didn't love Mateya and Madikwe, but exactly because we loved our safari experience so much that I was concerned that I would not be able to do it justice. Ordinarily, when I write a blog post, I have at my disposal not only photos taken with my DSLR camera, but also photos taken with a second DSLR camera, some of which are usually taken by me and some by Ian. The second camera's main goals are (1) to take photos that can't be caught on my camera with its telephoto lens (in this instance, a fixed 300) and (2) to catch what I call atmospheric photos--photos of the lodge, tea in the bush, gin and tonics on the back of the vehicle, and most importantly, photos of each other. While away, the second camera and its memory cards appeared to be working perfectly. When we returned each day, I scrolled through the photos on each camera to check the shots we got. Yet, when I got home and attached the second camera to the computer to transfer the photos, they all disappeared--two cartridges of photos gone. How this happened is still a mystery. I purchased a data recovery application and saw photos on the two cartridges from many safaris ago (and long since deleted from the cartridges) but not from Mateya. The loss I felt from not having these photos was real. I cried; I had nightmares about losing all of my photos. I kept thinking of the shots we took that we no longer had--sunset at the dam, Werner and Christine's dog sitting in the safari vehicle, a Leadwood tree against the yellow sunrise, the adorable containers for snacks off the back of the vehicle, a multitude of landscape shots (even if I'm still not so good at those), Ian on safari, Paul tracking, and, of course, the infamous indoor/outdoor shower. Every time, I sat down to write this post, I thought about those photos and with the loss, I also felt guilt. I should have known better; how could I have let this happen. I know there are backup devices, and yet I didn't have one with me. Lesson learned; I now have one, and it will be used religiously. Proof that we saw the photos on that devil of a camera! 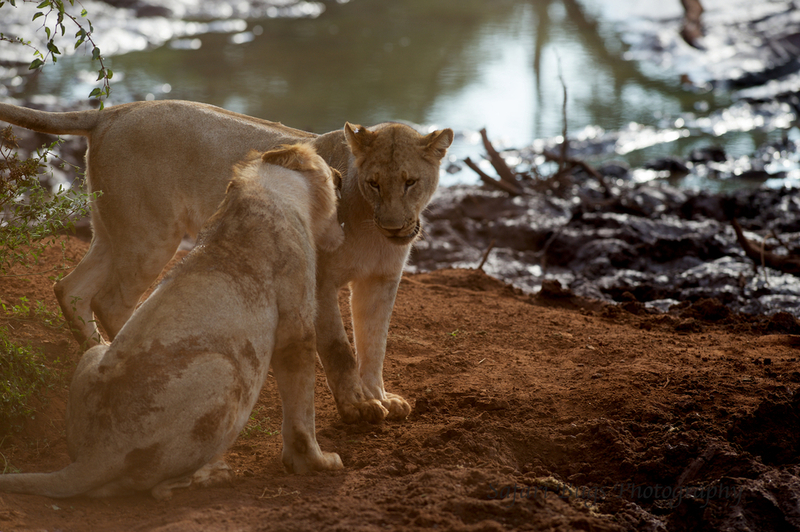 Without these photos, I also questioned how I would be able to describe the beauty of Mateya and Madikwe. Like many of us in the social media age, I rely on photos to do what I'm concerned my words won't be capable of doing. Hopefully, this post has done Mateya and Madikwe justice. If not, well, we'll just have to go back soon (this time with my backup drive) to get photos of that shower. *P.S. Photos used in this post were taken with a Nikon D4 with a prime 300 lens, a small point and shoot Nikon, and a GoPro. The prime 300 takes a fabulous photo but it's always at 300. 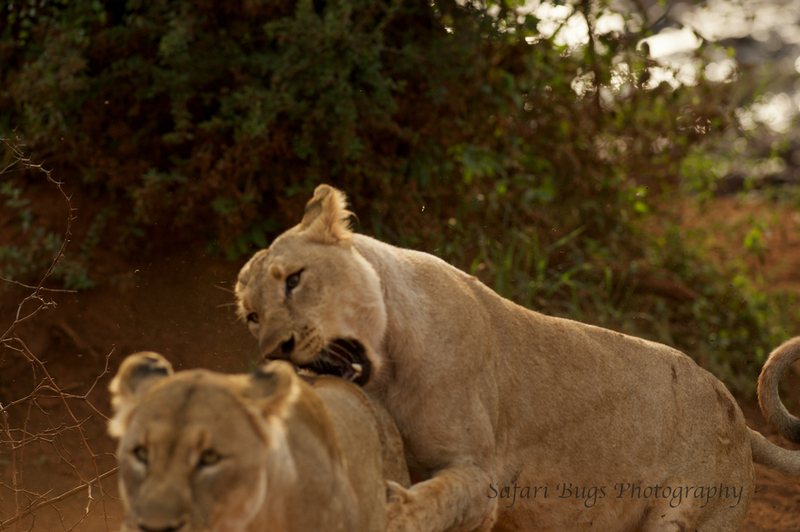 So, while shooting the lions at play, there were some shots that I was not able to get as the lions moved too close and in and out of the frame. Werner was similarly challenged until changing lenses. Ian, however, had on a lens that went from 18 to 300. And, every time, Werner and I proclaimed, "ooh, couldn't get that shot," Ian responded: "I got it!" The shots that got away. We'll never know if Ian really got those shots thanks to my handiwork with failing to back up those photos . . . . One of the shots Ian "got" was of the male cubs jumping a water puddle. When it happened, each of us actually got a shot, but Werner noted that with his shot, the focus point was the water and not the lion. My initial thought was, "who cares, it's in focus!" But, he's right; the focus points matter. I also got the shot, and my focus points were also not the lion during his leap. You be the judge though as to whether it matters. *P.S.S. The trip to Mateya was planned by our wonderful travel agent, Jeanie Fundora at Travel Beyond. Jeanie has been planning trips to Africa for 16 years and has been named by Travel + Leisure magazine to its prestigious A-List for her expert knowledge in Africa, having traveled to Africa 21 times. 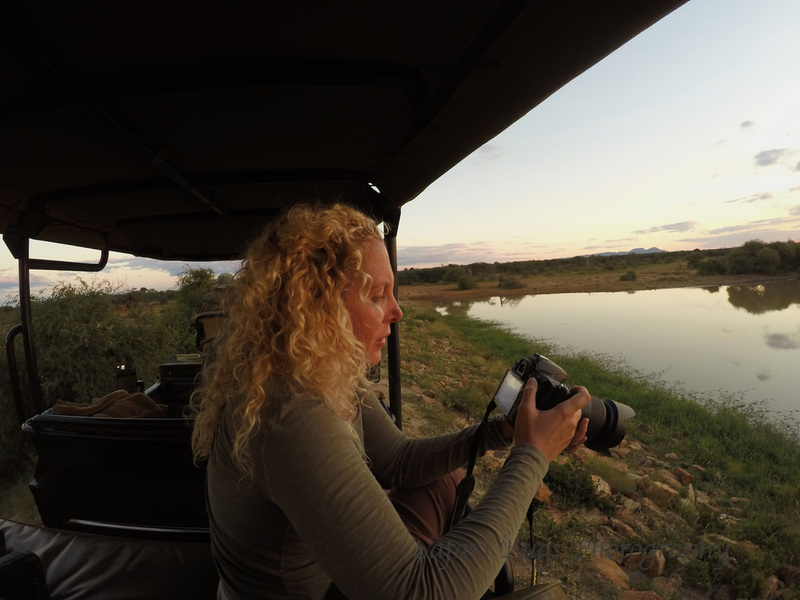 Jeanie is as a fierce advocate for her clients, making sure every need is accommodated on diverse trips from honeymoon safaris to multi-generational family safaris in both East and Southern Africa as well as India. If there’s a way to make out-of-the-ordinary details work, Jeanie will find it. *P.S.S.S. My brother, Steve (who should join us on a safari with his awesome wife Ashleigh), provided editorial support, i.e., finding my numerous typos. Steve also thinks that Ian should also take two showers a day. And, of course, Ian provided invaluable content for this blog and is my favorite travel companion in life!